Sports coloring pages are perfect for your little athlete. Do your kids have those days when they want to bring the outside sports indoors? Well now they can with these sports coloring pages. These sports coloring pages are a great way to teach your child about different sports from all over the world. You'll find every kind of sport from baseball, football, basketball, and soccer to volleyball, gymnastics, dancing, and surfing in these coloring pages. Just select your favorite sports coloring worksheets for your little athlete and print them out for instant enjoyment! No matter your child's favorite sport, there is a sports coloring page for him. Colour in Jackie Robinson, a baseball player that paved the way for many great talents in baseball. Find all the hidden objects in this mixed-up picture. Is your kid getting into the World Cup spirit? Help her out with this fun-to-complete, colour-by-number activity. A twist on the classic colour-by-number, this fun coloring activity gets in some letter recognition practise. 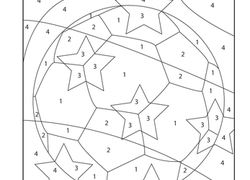 Soccer stars, have some fun with this colour by number page. Your little sport will get to practise number recognition and counting as she colors. 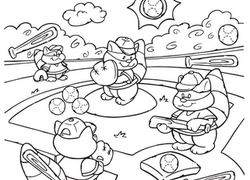 Little martial artists will have a blast coloring this karate-themed colour by number! They will practise counting and number recognition as they colour. Colour in this graceful figure skater coloring page as she glides across the ice. Go team! Your little cheerleader will have a blast coloring in these cheerleading coloring pages. 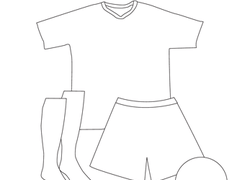 On this worksheet, your child will get the chance to be creative and design a World Cup uniform any way she likes. Does you child love to run? She can imagine it's race day as she colors in this finish line scene. It's a photo finish! 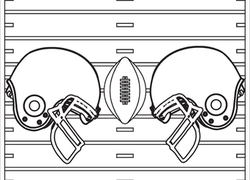 A coloring page of a quarterback on the field, just in time for fall football. Take a swing at this colour by number, featuring a classic American sport. Your little all-star will get to practise his number recognition as he colors. Colour in this swimming coloring page to get in the mood for summer! Ready... break! Take a coloring timeout with your child and enjoy this football coloring page, full of fun facts to read as you colour.